I’ve been saying it for years and I’ll say it again, any discussion about Israel and Palestine that doesn’t begin and end with the word Occupation is fatally flawed. Recently I’ve begun saying, along with a growing number of Israeli Jews, the Occupation of Palestine by Israel is not sustainable. This woman could conceivably become one of them. She’s amazed that two groups of Palestinian Muslims came into her home and prayed. And I’m amazed that this young and conservative Settler mom is speaking out about it. Heck it’s taboo here in the United States. So I’m sure you don’t have to wonder how radical she’s perceived in an established Settlement in Occupied Palestine. In addition to being amazing it’s also wonderful and pretty much unbelievable. Earlier this week Pulitzer Center on Crisis Reporting grantee Iris Zaki, wrote about Michal, the woman you see here. Together they are learning about the real hearts and minds of Palestinians. I’m calling Michal a prophet because she is doing what only prophets can do. She, in her bold support of a Palestinian teenager, puts the rest of us to shame. Whenever, as a member of a settlement community, you stray from the tribal mantra that all “Arabs are terrorists” you have to be strong, very strong. Please read on. 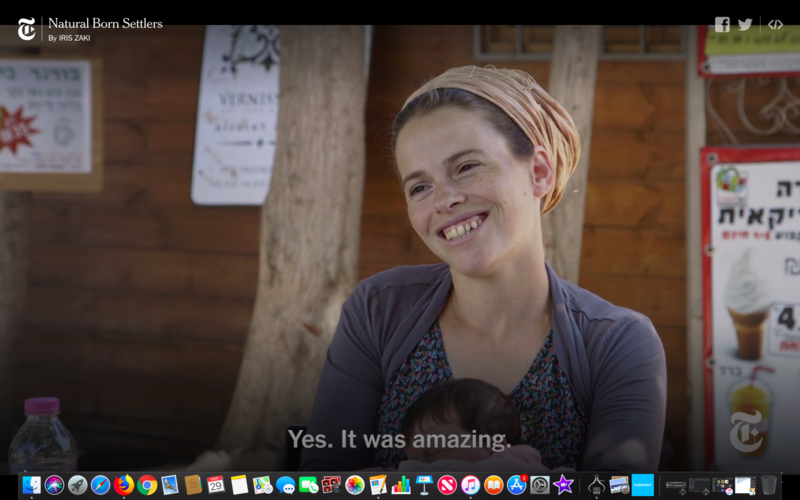 Zaki’s conversation with Michal in the Jewish Settlement of Tekoa in Palestine is a welcome breath of fresh air compared to most of what we hear from Palestine and Israel. And no, this is not fake news. It may sound a bit strange though since most of us aren’t used to hearing balanced and nuanced descriptions of Palestinians. Most often they are referred to as “Arab Muslim terrorists.” We don’t often hear them described fairly. Need I say more about how prophets are often abused in their own time and place? Oh, and I think the interviewer Zaki assumed that comment must have come from a Palestinian. Listen closely to the interview. She’s talking about a member of her Jewish settlement community. I think this is a rare but beautiful example of how religious belief can work for good. Apparently Michal believes God put her where she is, to be a messenger. (Looking at her bright, clear eyes I’m reminded the word for messenger and the word for angel are one and the same in Hebrew.) This angel is a bridge to a resolution for all the pain caused by the Occupation. I welcome any comments, concerns you may have about this. I will be writing more on this subject.